We propose a new low complexity, low delay, and fast converging frequency-domain adaptive algorithm for network echo cancellation in VoIP exploiting MMax and sparse partial (SP) tap-selection criteria in the frequency domain. We incorporate these tap-selection techniques into the multidelay filtering (MDF) algorithm in order to mitigate the delay inherent in frequency-domain algorithms. We illustrate two such approaches and discuss their tradeoff between convergence performance and computational complexity. Simulation results show an improvement in convergence rate for the proposed algorithm over MDF and significantly reduced complexity. The proposed algorithm achieves a convergence performance close to that of the recently proposed, but substantially more complex improved proportionate MDF (IPMDF) algorithm. The popularity of voice over internet protocol (VoIP) coupled with an increasing expectation for natural communication over packet-switched networks has called for improvement in VoIP technologies in recent years. As network systems migrate from traditional voice telephony over public switch telephone network (PSTN) to packet-switched networks for VoIP, improving the quality of services (QoS) for VoIP has been and will remain a challenge [1, 2]. As described in , several factors that can affect the QoS for VoIP include the choice of speech coder-decoders (codecs) , algorithmic processing delay , and packet loss , where the algorithmic delay is one of the significant factors for determining the budget for delay introduced by network echo cancellers. The problem of network echo is introduced by the impedance mismatch between the 2- and 4-wire circuits of a network hybrid , which occurs in VoIP systems, where analog phones are involved in PC-to-phone or phone-to-phone connections , where "PC" represents all-digital terminals. Acoustic echo, on the other hand, occurs when hands-free conversations are conducted . Transmission and algorithmic processing cause the echo to be transmitted back to the originator with a delay, hence impeding effective communication. As a result, network echo cancellation for IP networks has received increased attention in recent years. 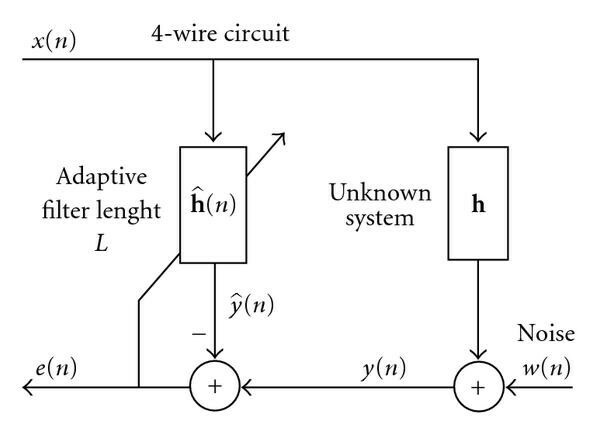 For effective network echo cancellation (NEC), adaptive filters such as shown in Figure 1 have been employed for the estimation of network impulse response. Using the estimated impulse response, a replica of the echo is generated and subtracted from the far-end transmitted signal. The main aim of this work is therefore to address the problem of (NEC) with reduced complexity and low algorithmic delay through the use of adaptive algorithms. In VoIP systems, where traditional telephony equipment is connected to the packet-switched network, the resulting network impulse response such as shown in Figure 2 is typically of length 64–128 milliseconds. This impulse response exhibits an "active" region in the range of only 8–12 milliseconds duration, and, consequently, it is dominated by "inactive" regions, where magnitudes are close to zero making the impulse response sparse. The "inactive" region is principally due to the presence of bulk delay caused by unknown network propagation, encoding, and jitter buffer delays . One of the first algorithms which exploits this sparse nature for the identification of network impulse responses is the proportionate normalized least-mean-square (PNLMS) algorithm , where each filter coefficient is updated with a step-size which is proportional to the coefficient magnitudes. The PNLMS algorithm is then shown to outperform classical adaptive algorithms with a uniform step-size across all filter coefficients such as the normalized least-mean-square (NLMS) algorithm for NEC application . Although the PNLMS algorithm achieves fast initial convergence, its rate of convergence reduces significantly. This is due to the slow convergence of filter coefficients having small magnitudes. To mitigate this problem, subsequent improved versions such as the improved PNLMS (IPNLMS)  and the improved IPNLMS  algorithms were proposed. These algorithms share the same characteristic of introducing a controlled mixture of proportionate (PNLMS) and nonproportionate (NLMS) adaptation. Consequently, these algorithms perform better than PNLMS for sparse impulse responses. A sparse network echo impulse response, sampled at 8 kHz. The increase in VoIP traffic in recent years has resulted a high demand for high density NEC in which it is desirable to run several hundred echo cancellers in one processor core. Defining as the length of the impulse response, the PNLMS and IPNLMS algorithms require approximately and number of multiplications per sample iteration respectively compared to for the substantially slower converging NLMS algorithm. Hence, in order to reduce the computational complexity of PNLMS and IPNLMS, the sparse partial update NLMS (SPNLMS) algorithm was recently proposed , which combines two adaptation strategies: sparse adaptation for improving rate of convergence and partial-updating for complexity reduction. For the majority of adapting iterations, under the sparse partial (SP) adaptation, only those taps corresponding to tap-inputs and filter coefficients both having large magnitudes are updated. However, from time to time the algorithm gives equal opportunity for the coefficients with smaller magnitude to be updated by employing MMax tap-selection . This only updates those filter taps corresponding to the largest magnitude tap-inputs. It is noted that partial update strategies have also been applied to the filtered-X LMS (FxLMS) algorithms as described in [14, 15]. Other ways to reduce the complexity of adaptive filtering algorithm include the use of a shorter adaptive filter to model only the active region of the sparse impulse responses as described in . It is well known that frequency-domain adaptive filtering such as the fast-LMS (FLMS) algorithm  offers an attractive means of achieving efficient implementation. In contrast to time-domain adaptive filtering algorithms, frequency-domain adaptive algorithms incorporate block updating strategies, whereby the fast-Fourier transform (FFT) algorithm  is used together with the overlap-save method [19, 20]. However, one of the main drawbacks of these frequency-domain approaches is the delay introduced between the input and output, which is generally equal to the length of the adaptive filter. Since reducing the algorithmic processing delay for VoIP applications is crucial, frequency-domain adaptive algorithms with low delay are desirable especially for the identification of long network impulse responses. The multidelay filtering (MDF) algorithm  has been proposed in the context of acoustic echo cancellation for mitigating the problem of delay. 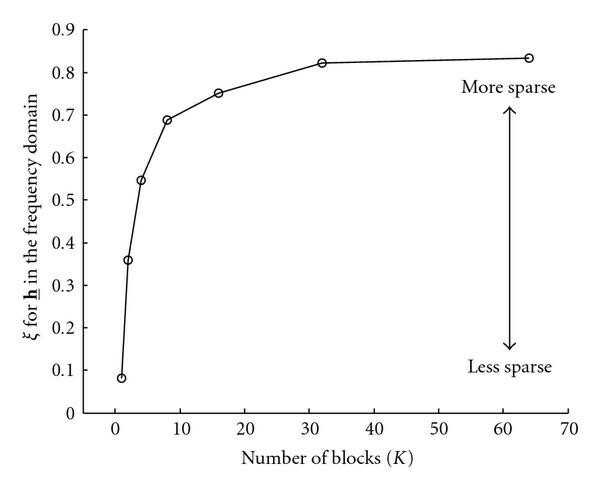 This algorithm partitions an adaptive filter of length into blocks each of length . As a result, the delay of MDF algorithm is reduced by a factor of compared to FLMS. The benefit of low delay for MDF over FLMS in the context of NEC has been shown in . The aim of this work is to develop a low complexity, low delay, and fast converging adaptive algorithm for identifying sparse impulse responses presented in the problem of NEC for VoIP applications. We achieve this by incorporating the MMax and SP tap-selection into the frequency-domain MDF structure. As will be shown in this work, applying the MMax and SP tap-selection to frequency-domain adaptive filtering presents significant challenges since the time-domain sparse impulse response is not necessarily sparse in the frequency domain. We first review in Section 2 the SPNLMS and MDF algorithms. We then propose, in Section 3.1, to incorporate MMax tap-selection into MDF structure for complexity reduction. We show how this can be achieved using two approaches and we compare their tradeoffs in terms of complexity and performance. We next illustrate, in Section 3.2, how the sparseness of the Fourier transformed impulse response varies with the number of blocks in the MDF structure. Utilizing these results, we show how the SP tap-selection can be incorporated into the MDF structure for fast convergence and low delay. The computational complexity for the proposed algorithm is discussed in Section 3.3. In Section 4, we present the simulation results and discussions using both colored Gaussian noise (CGN) and speech inputs for NEC. Finally, conclusions are drawn in Section 5.
where is the additive noise. The sparse partial (SP) update NLMS (SPNLMS) algorithm  utilizes the sparse nature of network impulse response. This algorithm incorporates two updating strategies: MMax tap-selection  for complexity reduction and SP adaptation for fast convergence. Although it is normal to expect that adapting filter coefficients using partial-updating strategies suffers from degradation in convergence performance, it was shown in  that such degradation can be offset by the SP tap-selection. The variables and define the number of selected taps for MMax and SP, respectively, and the MMax tap-selection criteria given by (6) for the time-domain is achieved by sorting using, for example, the SORTLINE  and short sort  routines. It has been shown in  that, including the modest overhead for such sorting operations, the SPNLMS algorithm achieves lower complexity than NLMS. To summarize, SPNLMS incorporates MMax tap-selection given by (6) and SP tap-selection given by (7) for complexity reduction and fast convergence, respectively. where denotes complex conjugate, is the forgetting factor and is the step-size with . Letting be the input signal variance, the initial regularization parameters  are and . For and , MDF is equivalent to FLMS . The difference between (20) and (21) is that the latter employs , and we will describe in the following how this diagonal matrix can be obtained for the cases of MMax and SP tap-selection criterion. Hence, it can be seen that elements in the vector are obtained from the block of the selected Fourier transformed tap-inputs contained in with indices from to . The adaptation of MMax-MDFN algorithm is described by (23)–(25) and (21). for and . As opposed to MMax-MDFN, we denote this scheme as the MMax-MDF algorithm since normalization by is removed. Accordingly, elements in for MMax-MDF are computed using (24) and (25), where is obtained from (26). Hence, the adaptation of MMax-MDF algorithm is described by (24)–(26) and (21). As will be shown in Section 4, the degradation in convergence performance due to tap-selection is less in MMax-MDFN than in MMax-MDF. However, since reducing complexity is our main concern, we choose to use MMax-MDF as our basis for reducing the computational complexity of the proposed algorithm. As will be described in Section 3.2, the proposed algorithm incorporates the SP tap-selection to achieve, in addition, a fast rate of convergence. where denotes -norm and it was shown in [26, 27] that increases with the sparseness of , where . As can be seen from Figure 4, the magnitude of becomes more sparse as increases. As a consequence, we would expect SP tap-selection to improve the convergence rate of MDF for sparse system identification. Sparseness of the magnitude of against . for . Employing (32), the diagonal matrix in (21) for the SP tap-selection can be described by (24) and (25). This enables to reduce with increasing hence allowing adaptation to be more concentrated on the "active" region. A good choice of has been found experimentally to be given by . The proposed SPMMax-MDF algorithm is described in Algorithm 1. Although it is well known, from the computational complexity point of view, that is the optimal choice for the MDF algorithm, it nevertheless is more efficient than time-domain implementations even for . As shown in Algorithm 1, the proposed SPMMax-MDF computes using tap-selection matrix , which is defined by (26) and (32) for and , respectively. We show in Table 1 the number of multiplications and divisions required for MDF, MMax-MDF, MMax-MDFN, and SPMMax-MDF to compute the term . We have also included the recently proposed IPMDF algorithm  for comparison. It should be noted that for MMax and SP tap-selection in (26) and (32), no additional computational complexity is introduced since and can be obtained from (18) and (17), respectively. For MMax-MDFN, however, computing the selected filter coefficients for adaptation using (23) incurs additional number of divisions. The complexity for each algorithm for an example case of , , and is shown in Table 2. It can be seen that the complexity of the proposed SPMMax-MDF is approximately of that for the MDF. Compared to MMax-MDF, SPMMax-MDF requires only an additional of multiplications and divisions. However, as will be shown in Section 4, the performance of SPMMax-MDF is better than MMax-MDF. Finally, the complexity of SPMMax-MDF is and of that for the IPMDF algorithm in terms of multiplications and divisions, respectively. We used a sampling frequency of 8 kHz and white Gaussian noise (WGN) was added to achieve a signal-to-noise ratio (SNR) of 20 dB. The following parameters for the algorithms are chosen for all simulations : . Step-size control variable has been adjusted for each algorithm so as to achieve the same steady-state performance. 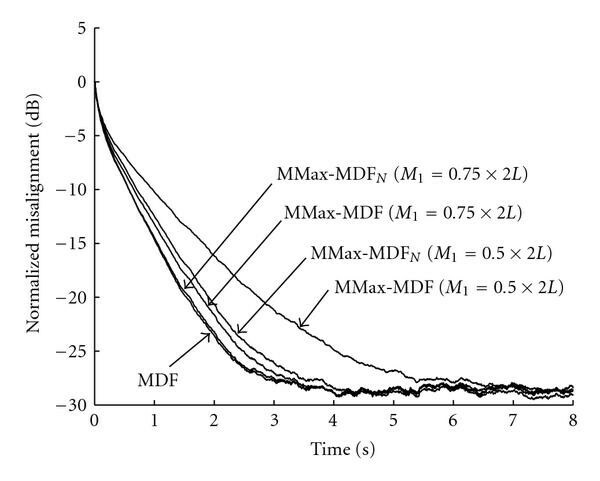 We first compare the variation in convergence of MMax-MDFN and MMax-MDF with using step-size control variables and for MMax-MDFN and MMax-MDF, respectively. We used a CGN input generated by filtering zero-mean WGN through a lowpass filter with a single pole . 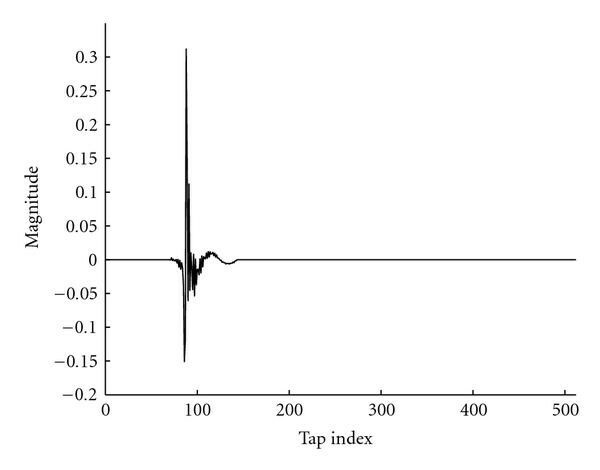 It can be seen from Figure 5 that for each case of , the degradation in convergence performance due to tap-selection is less for the MMax-MDFN than the MMax-MDF. However, as shown in Tables 1 and 2, MMax-MDFN incurs additional divisions compared to the MMax-MDF algorithm. Variation of performance with for MMax-MDF N and MMax-MDF. We next compare the convergence performance of SPMMax-MDF with MDF and IPMDF using CGN input for in Figure 6. We have used and for all algorithms. We have also used since it was shown in  that by such setting, a good balance between complexity reduction and performance degradation due to MMax tap-selection can be reached. As can be seen from the figure, the performance of SPMMax-MDF is close to that for the MDF since for which results in according to (33). Consequently, under the condition of , all the filter coefficients are updated, while under the condition of coefficients are updated. As a result of this, and consistent with any partial update algorithms presented in , the performance of SPMMax-MDF approaches that for the MDF. 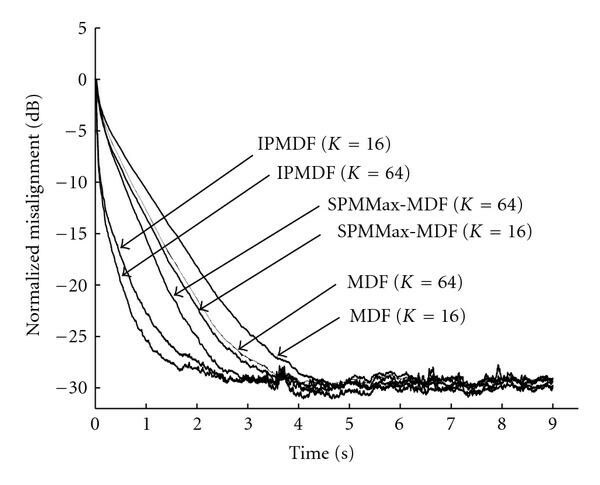 Compared to IPMDF, SPMMax-MDF only requires approximately and of the number of multiplications and division, as indicated in Table 1. Performance of SPMMax-MDF using CGN input for . We show in Figure 7 the convergence performance of SPMMax-MDF, MDF, and IPMDF for using CGN input. As before, we have used the same step-size control variable of for all algorithms except for the cases of SPMMax-MDF, where is used to archive the same steady-state performance. It can be seen that for , the proposed SPMMax-MDF algorithm achieves faster rate of convergence in terms of normalized misalignment compared to the more complex MDF during adaptation. Since, as shown in Figure 4, increases with , it can therefore be expected that such improvement can be increased when larger is employed. In addition, as the delay for MDF is reduced by a factor of compared to FLMS, the proposed SPMMax-MDF can archive further delay reduction for larger and thus is desirable for NEC. For the case of and , the number of multiplications and divisions required for each algorithm is shown in Table 2. Performance of SPMMax-MDF for CGN input with and . Figure 8 shows the performance of the algorithms obtained using a male speech input. Parameters used for each algorithm are the same as that for the previous simulations except that for SPMMax-MDF, where we have used to achieve the same steady-state performance. The computational complexity required for each algorithm is also shown in the figure between square brackets, where the first and the second integers represent the number of multiplications and divisions, respectively. It can be seen that SPMMax-MDF achieves approximately dB improvement in terms of normalized misalignment with lower complexity in comparison to MDF. 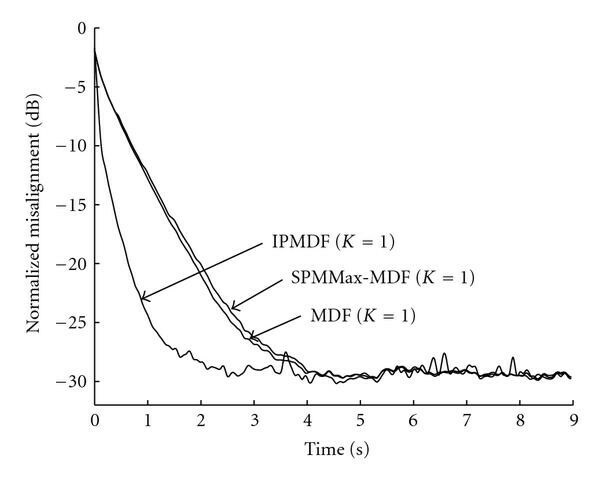 In addition, the performance of our low cost SPMMax-MDF algorithm approaches that of IPMDF. 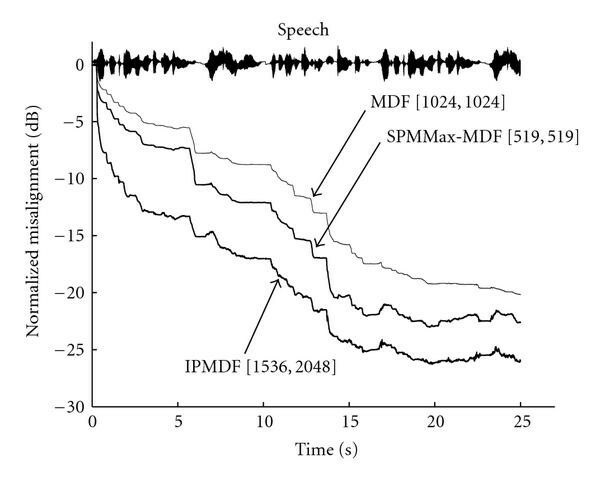 Performance of SPMMax-MDF using speech input for , and the computational complexity required for each algorithm. We have proposed SPMMax-MDF for network echo cancellation in VoIP. This algorithm achieves a faster rate of convergence, low complexity, and low delay by novelly exploiting both the MMax and SP tap-selection in the frequency domain using MDF implementation. We discussed two approaches of incorporating MMax tap-selection into MDF and showed their tradeoff between rate of convergence and complexity. Simulation results using both colored Gaussian noise and speech inputs show that the proposed SPMMax-MDF achieves up to dB improvement in convergence performance with significantly lower complexity compared to MDF. In addition, the performance of our low cost SPMMax-MDF algorithm approaches that of IPMDF. Since the MDF structure has been applied for acoustic echo cancellation (AEC)  and blind acoustic channel identification , where the impulse responses are nonsparse, the proposed SPMMax-MDF algorithm can also be potentially applied to these applications for reducing computational complexity and algorithmic delay. Algorithm 1: The SPMMax-MDF algorithm.